The Frame Shop will be closed Thursday, July 19, for placing orders. However, customers will be able to pick up completed/finished order on that day without any problem. 9:30 a.m.-12:30 p.m. and 3-5 p.m.
Closed July 4. Open regular hours July 5, 6. 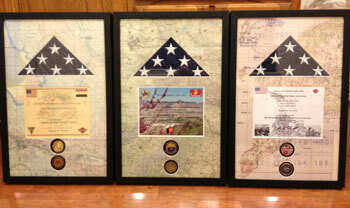 We have an extensive selection of frames to choose from and we specialize in customized shadow boxes and flag cases. At the Frame Shop, customers can frame their own projects or have our professionally trained staff do it for them. We believe our framing prices are the best in the Pikes Peak region, and we’ll prove it. Bring in your framing price quote from a competitor and we’ll not only match it … but take off an additional 10 percent! Read some great comments about the fine craftsmanship you’ll find in our Framing and Engraving shop. “I just wanted to pass on a ‘great job’ to one of your employees. Peter, at the Frame Shop, fixed a poor project (from a frame shop a few years ago in FL) and then tackled another project I had for him with WONDERFUL results. Superb results, great customer service and a fair price. Again my thanks.